As smoke billows from unnervingly early-season wildfires charring the Australian state of Tasmania, yet more dust is settling on the scientific discussion over how climate change contributed to last year’s deadly Australian heat. 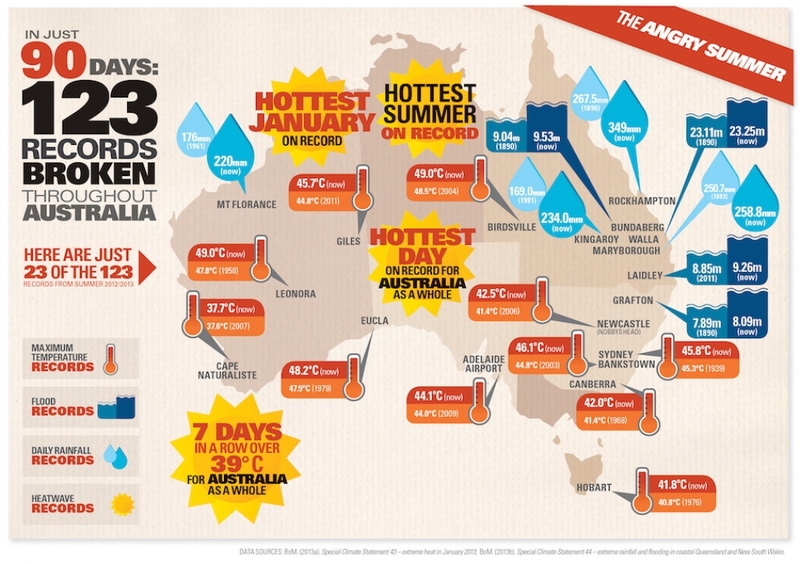 Last year was Australia’s hottest on record. And each of a set of five research papers published Monday in a special edition of the Bulletin of the American Meteorological Society reached the same conclusion regarding the year of unprecedented heat. The research teams independently concluded — in two cases writing that they could do so with “essentially” 100 percent certainty — that climate-changing greenhouse gas pollution played a substantial role in fueling it. 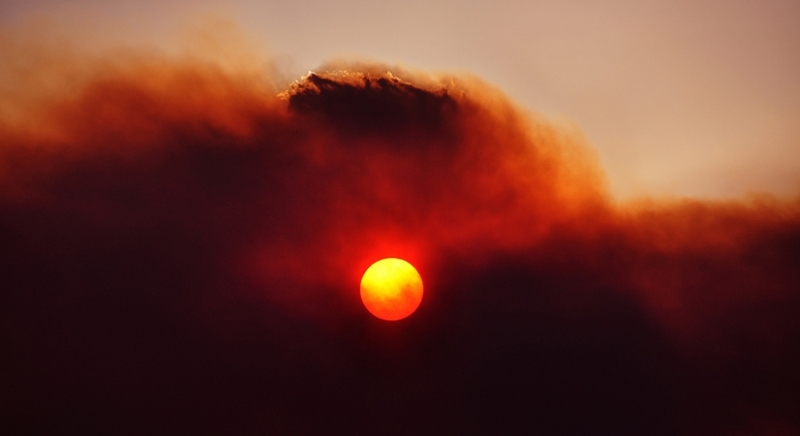 Bushfire smoke fills the sky over the Southern Midlands in Tasmania last year. Australia has left behind its climate of generations past and moved into an era where extreme heat waves and warm winter months, such as those of 2013, are more likely to occur, researchers concluded. “They’ve left behind the climate that they used to have,” said NOAA research meteorologist Thomas Knutson. Last year’s intense heat was perhaps most noticeable during summer, when temperatures of 120 degrees were recorded in some places. But the differences between recorded and average temperatures were greatest during the Austral winter and fall. Never in more than a century of record-keeping has the average Australian temperature reached last year’s level. The high temperatures and frequent heat waves were the combined result of natural variation and human influence on the climate. Low rainfall that contributed to the hot conditions does not appear to have been caused by climate change, one of the research teams concluded. That natural phenomenon combined with unnatural climate change-juiced heat, however, leading to extraordinary temperatures. Heat waves killed hundreds of people, delayed play and injured players at Melbourne’s Australian Open, and caused 100,000 bats to spectacularly tumble from their perches, dead. “We now have some very solid, quantitative work that says, ‘Hey, wait a minute, climate change is implicated in these things,’” said Australian National University professor Will Steffen, who was a climate commissioner until the new federal government terminated the nation’s climate advisory group. The former government agency has since reconstituted itself as an independent nonprofit. Steffen said he hopes the findings from Monday’s papers reach the desk of Australian prime minister Tony Abbott. Abbott promptly repealed the country’s carbon tax after gaining power and he is a conspicuous critic of efforts by other world governments to fight climate change. Australia is one of the world’s highest per-capita contributors to greenhouse gas pollution. Two of the five research teams — one from Australia and one from the U.S. government — used similar methodology to reach similar conclusions. They each ran thousands of computer simulations to test for the likelihood of last summer’s intense heat occurring in a nation whose atmosphere is filled with current levels of greenhouse gases, then compared those results with similar simulations involving lower pre-industrial greenhouse gas concentrations. “It turns out that the model-simulated trends over the region are matching up quite well with the observed warming that we’re seeing,” said NOAA’s Knutson. Knutson and two NOAA colleagues calculated that, of an average of 1.72°C of abnormal warmth in Australia throughout 2013, human-driven climate change was responsible for 0.81°C. The rest was the result of natural forces and variability. The NOAA scientists wrote that the confidence with which modeling showed that climate change contributed to the increased risk of such intense heat in Australia last year was “essentially” 100 percent. Last year’s weather was brutal across Australia, with a drought also setting in across much of its eastern flank. “The heat of 2013 in this region of Australia was strongly related to the lack of rainfall,” said University of Melbourne meteorology professor David Karoly. He coauthored a paper published Monday that investigated the relationships between climate change, the drought and the extreme heat. The researchers did not find evidence that the drought was caused by climate change. Last year’s extreme heat and drought fueled wild bushfire seasons, one of the worst of which ravaged the southeastern island state of Tasmania. Dozens of fires broke out in Tasmania over the past weekend as state authorities instituted the earliest-season ban on open fires that they have ever put in place. “We’re all a little surprised,” a fire department spokesman said. Steffen said there’s “a link” between the early-season Tasmanian fires and the findings published in Monday’s five papers. That’s because hot temperatures, which are being driven by climate change, are worsening and extending wildfire seasons.